Atherstone Town. JW Hunt Cup Winners 2017/18. The JW Hunt Cup Charity football competition was formed in 1926 to raise funds for the sole benefit of the local blind. It is named in memory of John William Hunt, a local business man and benefactor. JW Hunt founded the local Chillington Tool Company and was a supporter of local charities. It has been run every season since 1926/27 season. The inaugural winners being Short Heath United who beat Cannon Iron at Molineux, Wolverhampton in April 1927. Over £350,000 has been raised since!. 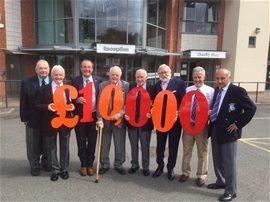 Season 2017/18 was the JW Hunt Cups 92nd season and we have donated £10000 to the Beacon Centre. Teams compete from the Birmingham, Staffordshire, Shropshire and Worcestershire Football Associations. In January 2013 JW Hunt Cup President Alex Hamil was presented with the MBE by HRH Prince Charles at Buckingham Palace. Alex received the award for services to football and the visually impaired (Photo above). This seaons JW HUNT CUP FINAL will be held at the Molineux on Monday 13th May kick off 7.30pm. Highgate Utd will play the winners of the semi between Sporting Khalsa or Tividale. 1. Atherston Town 0v 0Highgate United. Highgate won 4-3 after penalties. The next Meeting will be held on Thursday 2nd May at 7.30pm. Venue Fordhouses Cricket Club. 2017/18 JW HUNT CUP FINAL. The season's 92nd JW Hunt Cup Final was held at AFC Wulfrunian's ground on Tuesday 22nd May 2018. Atherstone Town 1v0 Wolves Sporting Community in an entertaining hard fought game. The winner for Atherstone came six minutes from the final whistle through Liam Kirton. Atherstone won the JW Hunt Cup Final for the first time and also became the first Warwickshire club to win the cup. 2018 Officials; Referee ;Jamie Lunn. Assistants;Richard Cattell and Richard Booth. Fourth Official;Tony Lloyd. CITY COUNCIL AWARD FOR OUR SECRETARY ALAN RYDER. We are pleased to inform you that our long serving Secretary Alan Ryder's work has been recognised by Wolverhampton City Council. For his work over many years in football administration with local football club's and the JW Hunt Cup in particular, Alan has been awarded the Wolverhampton City Advisory Sports Council's prestigous "H.E.LANE OBE Memorial Trophy". November 28th at Fordhouses Cricket Club.